This release is limited to 500 CD's and 500 LP's, which are all signed and hand numbered. Komma is a double album and a photobook in one, and tells the story about Het Krekengebied (creek area) of the ‘Land of Axel’. Next to a record with songs, played with band, this piece of art will also have a second record. This consists of an instrumental ode to one specific creek: ‘t Gat van Pinte. The Pictures are the result of roaming on the shores somewhere between Zaamslag and Spui for over two years. The music and images form a tribute to the mysterious creeks of Zeeuws-Vlaanderen, a country of water sides. 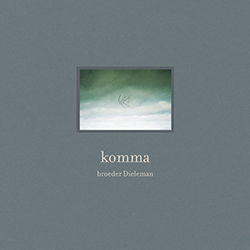 ‘Komma’ has become a true work of art, with the music and photography taking you to the place where broeder Dieleman lives and writes his music in a beautiful fashion.